When it comes to making great pizza, we feel there is a right way to do it. Here are some insights about Dragon Fire’s philosophy and what we call our pizza ethics. Neapolitan style pizza has been cooked in a wood fired, brick oven for several thousand years! It’s the original, longest lasting, and hottest way to cook a pizza. Our oven is a Mugnaini, hand-crafted in Tuscany, Italy by artisans that know how to handle heat. We know that growing your own food and picking it fresh off the vine tastes much better than that same item you might buy from a store. That is why we source our produce, meats, cheeses, and toppings locally to ensure we have the highest quality ingredients around. We work with local farms and support our community to help grow area businesses and jobs. Overall, we choose items that fit our philosophy and give true treasures to our guests. So, we start by hand making our dough every day. Our tomato sauce is made on site, you guessed it, daily. We have partnered with Ludwig’s farmstead creamery in Fithian for fresh local cheeses and work with Old Time Meat and Deli in Champaign for our all natural, artisanal sausage. These two businesses and others we work with share our philosophy of hand-crafted deliciousness. Top it off with fresh local produce and you get a high quality treasure; pizzas that are exceptionally delicious and unlike any others currently being served in Champaign-Urbana. Rather than make food hidden away in some kitchen and try to deliver it to you in a timely fashion so it does not get cold, we bring the kitchen to you and cook right in front of you. Our trailer can be pulled to your home, your office, your wedding rehearsal, or to an outdoor festival. We have a huge window so that you can watch your pizza being made from start to finish. It takes our crew less than five minutes to make your pizza. Did we mention the oven the cooks at over 1000 degrees? BE WARNED: Dragon Fire is the hottest fire in town, so be careful. Our pizzas are delivered straight out of the oven to you and they will be HOT! Welcome to the Dragon’s Lair!  Dragon Fire originated in Champaign, IL and is a local, family and veteran owned business. We have combined our knowledge and skills to build a strong foundation for our fledgling little dragon. After much debate and many pizza parties, Dragon Fire has evolved into the delicious options you can now purchase throughout town. If you haven’t tried it, please hunt the dragon to locate our mobile wood fired oven or summon the dragon if you would like us to cater an event!